DryShips (DRYS) along with LDK Solar (LDK) are probably the 2 most "controversial" companies we've owned - well maybe along with Crocs (CROX). Of the 3, we only own DryShips (DRYS) as of today, and earlier this week the company reported yet another stellar quarter. There are a lot of moving parts, but essentially the company reported $4.13 (vs analysts $4.05). This industry is essentially the companies that move grains, fertilizers, coal from one continent to another (think railroads on the ocean). Contracts are either longer term in nature or on the "spot market" (what the current market will bear). There are a horde of stocks in this sector, all with different ratios of long term contracts versus spot contracts. DryShips is far and away the most levered to spot pricing, which in times when the spot prices go up - is a great thing; but in times when spot pricing falls, is not a great thing. Below is the chart of the Baltic Dry Index which shows you the enormous volatility in spot rates. So obviously this is not a stock for feint of heart. However, the company has decided to finally put a portion of their ships on contract at long term rates (at very nice prices) so the volatility should abate just a little as DryShips protects some portion of their fleet from the day to day machinations of the spot pricing. Now I, in general just prefer to own the physical items these shippers are moving around the world, but there are some interesting developments happening in the sector. First, it takes time - and money to build new ships. One longer term issue I had with this sector [Oct 23: A Near Term Top in Dry Bulk Shippers] is the potential of a flood of new ships coming out in 24-36 months. While some are pointing to the 'credit crisis' as a reason it might be harder to fund new ships, I think this is more of a US/UK issue - there is enough petrodollars out there to finance whatever is needed in this world. But these recent stories about the ever higher steel costs might be a true impediment [May 17: WSJ - Fast Rising Steel Prices Set Back Big Projects]. Now on the flip side to that, this is a tricky "reason" to buy companies in this sector because while it might be considered a "pro" for the sector, the same reason would be a "con" for the global economic growth engine, which is what is the underlying story behind these type of stocks. So it's a close call on if this might be a pro or con. I am also particularly excited with the implementation of our strategic vision to create a leading presence in the ultra deep water drilling (UDW) market and to take advantage of the extremely positive fundamentals of that sector. The acquisition of Ocean Rig, which already operates two UDW rigs, and the agreement to construct two state of the art drillships create a significant platform for our foray into this sector. As we have mentioned before, we intend to spin off this business unit to our shareholders through a U.S. listing within the next 12 months. So as long as oil remains north of $75, this should be a very attractive business with the prices going for deep sea oil rigs, especially the ultra deep sea variety. 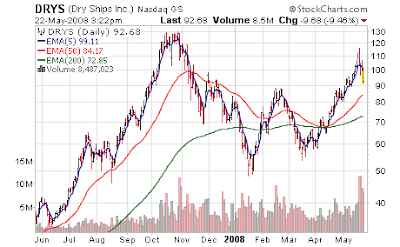 An IPO spinoff of this business would be a nice cherry on top for DryShips owners.